Daleks, vampires and Weeping Angels will join The Timelord when 'Doctor Who Live' tours the UK. 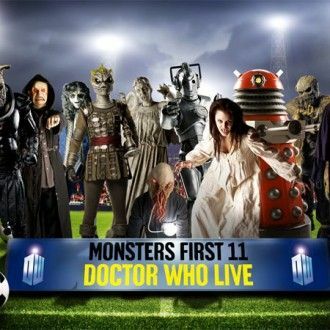 The iconic TV creatures among 11 different types of monster which take to the stage during the first live production of the sci-fi series, which launches in October. The live show is based on the popular BBC series which follows the adventures of time traveller The Doctor, and has been developed by 'Doctor Who' Executive Producer Steven Moffat. As well as the three infamous arch-enemies of the Timelord, he will also have to face Cybermen, Judoon, Silurian, Winders, Scarecrows, Clockwork Droids and Ood. The 25 live dates begin at London's Wembley Arena on October 8, and will visit Sheffield, Glasgow, Birmingham, Manchester, Nottingham, Cardiff, Liverpool and Belfast until November 7. As the characters will take to the stage, fans will also be able to watch the current Timelord, Matt Smith, through a special video screen. For more information on the upcoming tour, visit www.doctorwholive.com or call Ticketmaster's 24 hour ticket hotline on 0844 847 1963.